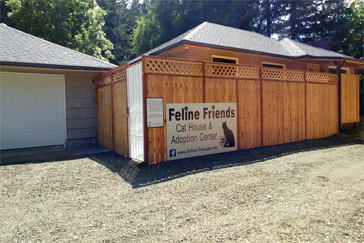 The purpose of the Feline Friends Cat House and Adoption Center (CHAC) is to facilitate the adoption of cats and kittens into caring, permanent homes. Quality: Ensuring the health and welfare of the cats/kittens by providing a clean, socially stimulating home environment. Service: Maintaining a comfortable, safe location for prospective families to meet and interact with cats available for adoption. Dedication: Helping people choose the right cat for their family and making the adoption process a positive experience. Education: Sharing information about cat related issues to enrich the lives of cats and their guardians.